You have not selected a favourite town. Click the note icon to save D-26434 Wangerland as a cookie. Shantys und maritime Lieder Shantychor "De Freesen ut Varel" e.V. Shantys und maritime Lieder Piraten-Seemanns-Chor „Vör Anker” e.V. 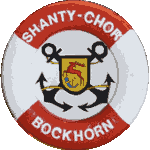 Shantys und maritime Lieder Shanty-Chor Bad Zwischenahn e.V.